Michael Hearne’s destiny has been tangled in wire and wood since he first laid his hands on a guitar at the age of seven. With a natural ear for harmony and an aptitude for picking, it wasn’t long before a young Michael Hearne was a fixture at parties and local events in his childhood hometown of Dallas. By the age of sixteen he had honed his skills on the guitar and, without a doubt in his mind about his destiny, he hit the road as a touring musician. Michael’s career over the next few decades would take him across the southwest and beyond. Calling the mountains of northern New Mexico home for many years, Michael shared his talents as a singer, songwriter, and picker in bars, listening rooms and dance halls throughout the region. In the 1980’s, he toured as a member of Michael Martin Murphey’s band, recording on Murphey’s 1982 self-titled album for Liberty Records. Hearne has penned songs for Jerry Jeff Walker and Gary P. Nunn (“Lesson to be Learned from Love”) and his New Mexico anthem, “New Mexico Rain,” was recorded by country music legend Johnny Rodriguez as well as by his uncle and aunt, Bill and Bonnie Hearne. Michael has also co-written with Mentor Williams, Andy Byrd, Shake Russell, Keith Sykes, and many others. Making a name for himself in his chosen hometown of Taos, New Mexico – Michael’s signature sound on the guitar and beautifully distinctive voice became an integral part of any two-stepping event in the area. Still a local favorite and a multi-time winner of Taos News ‘Best of Taos’ award for performer and singer – Michael wrote and recorded some of his best work during his years at the feet of the Sangre de Cristo Mountains. Recording countless albums both with his band South by Southwest and as a solo artist, and writing such classic tunes as the fan favorite “New Mexico Rain” and “High Road to Taos,” Michael found endless inspiration in the culture and natural beauty of the area. After hosting years of informal barn dances, Michael officially began his Big Barn Dance Music Festival in 2003. Now a three day event featuring the best songwriters and performers in Americana, Bluegrass, Country, Singer-Songwriter and everything in between, the event draws music aficionados from across the United States. Throughout the event, Michael is found either on-stage – adding his signature sound to the music of his friends and peers, or just to the side- soaking in the music and preparing to introduce the next talented act to his enraptured audience. After recording several albums in the early 2000s – including the critically-acclaimed concept album Sight and Sound: Songs Inspired by the Fine Art of Northern New Mexico (winner of seven awards at The New Mexico Music Awards), Michael made his way to Nashville, Tennessee. There, he wrote and recorded 2011’s Life in America – after surviving the historic Nashville floods in 2010. The album not only showcased some of Michael’s best songwriting to date, but the talents of producer Mark Fain and some of the top pickers in Music City, including Bryan Sutton, Stuart Duncan, and Andy Leftwich. With this new album in hand, Michael packed his bags for the nation’s other country music mecca – Austin, Texas. There, he teamed up with renowned Americana songwriter Shake Russell, touring throughout the year and recording a duo album as well as another solo album, Red River Dreams, in 2016. Still occasionally found performing with South by Southwest – made up of long time members Carmen Acciaioli, a musical master of the steel guitar, fiddle, mandolin, dobro, and hammered dulcimer; and the extremely talented Zeke Severson on stand up and electric bass – Michael makes a point to spend some time in his New Mexico homeland as well. Now with many miles behind him and countless stages beneath his feet, Michael has amassed a dedicated and ever-expanding fan base. 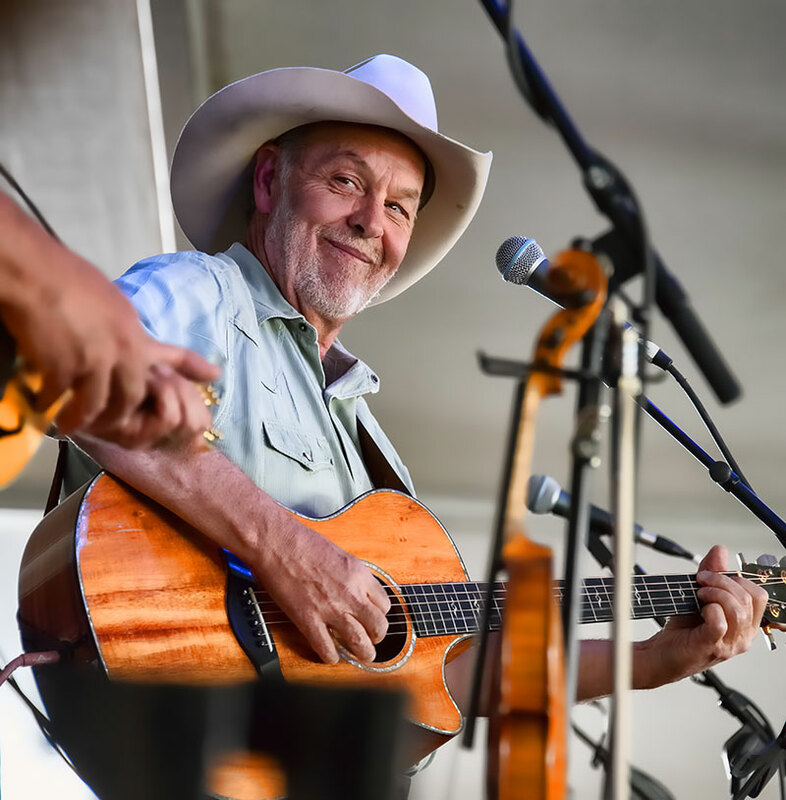 After many busy years of touring, recording, and promoting his Big Barn Dance Music Festival, Michael Hearne still has no doubt in his mind about his calling. Whatever he might be doing, Michael is sure to be found with a guitar in hand, his destiny intertwined as ever in wire and wood.